Lovis Corinth (1858–1925), Carl Hagenbeck in his Zoo (1911), oil on canvas, 200 × 271 cm, Hamburger Kunsthalle, Hamburg, Germany. Wikimedia Commons. Just before the outbreak of the First World War, Lovis Corinth was at the peak of his career, and with his wife Charlotte and their two young children, was enjoying everything that Berlin had to offer. He had also worked hard: by the end of 1911, he had painted more than three hundred substantial works in oils. Lovis Corinth (1858–1925), The Model’s Break (1909), oil on canvas, 60 × 42 cm, Staatliche Kunstsammlungen Dresden, Germany. Wikimedia Commons. Corinth seized the moment during The Model’s Break (1909) to capture a more informal and natural full-length portrait of her. This is not an uncommon ruse, which has resulted in some excellent paintings by other artists, and worked well for him too. This was exhibited in the 1913 exhibition of the Berlin Secession. Lovis Corinth (1858–1925), Ice Rink in the Berlin Tiergarten (1909), oil on canvas, 64 × 90 cm, Private collection. Wikimedia Commons. 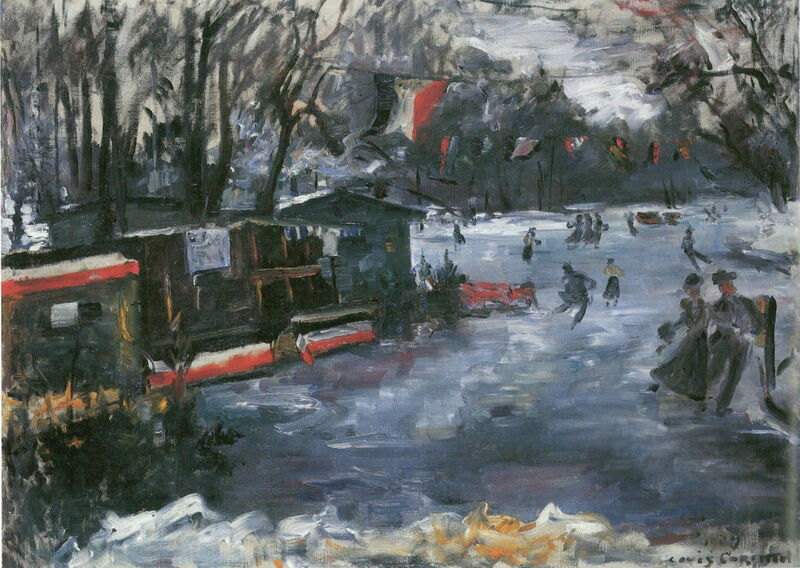 He painted the occasional urban landscape of the city too, such as his wintry Ice Rink in the Berlin Tiergarten (1909), where Berliners are skating on one of the zoo’s frozen lakes. 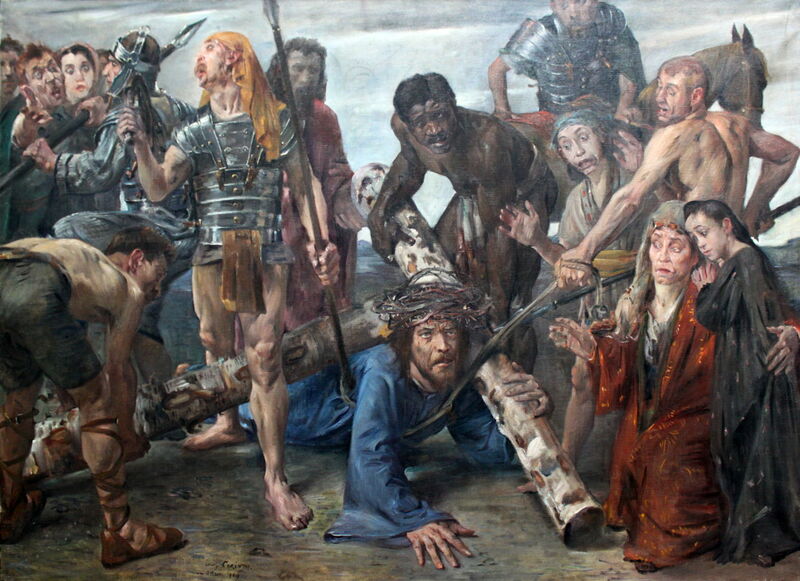 Lovis Corinth (1858–1925), Christ Carrying the Cross (1909), oil, dimensions not known, Städelsches Kunstinstitut und Städtische Galerie, Frankfurt. Wikimedia Commons. Corinth continued to explore Christ’s Passion in very real terms, in his Christ Carrying the Cross (1909). Although this contains most of the usual elements seen in traditional depictions, his language is contemporary, almost secular. Two men, one of them apparently African, are helping Christ bear his exhausting load, while a couple of soldiers are whipping him on, and threatening him with their spears. A third soldier is controlling the crowd at the upper left, and behind is a mounted soldier and one of the disciples. 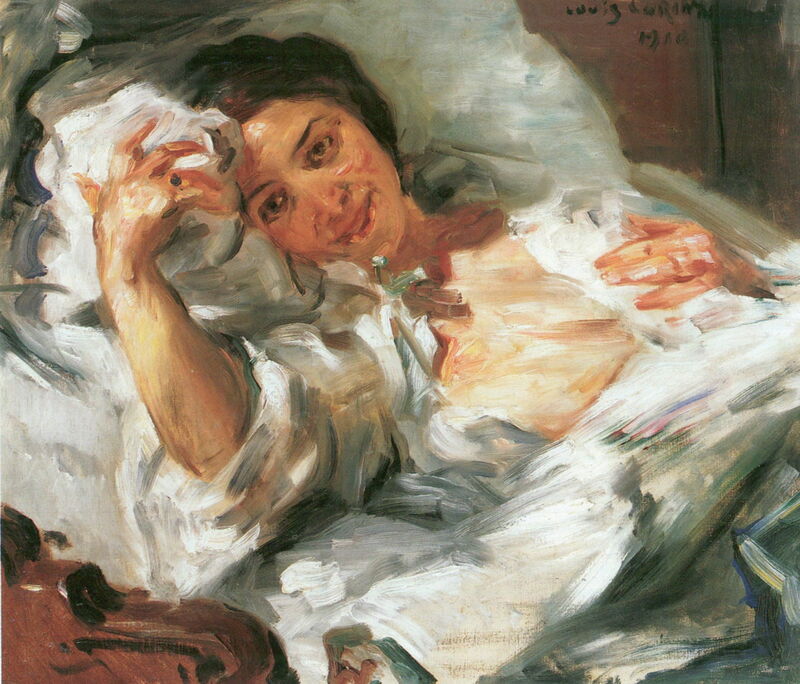 Lovis Corinth (1858–1925) Homeric Laughter (1909), oil on canvas, 98 × 120 cm, Bayerische Staatsgemäldesammlungen, Munich. Wikimedia Commons. together with the reference to Homer’s Odyssey book 8 line 326. This refers to a section in which Odysseus is being entertained by King Alcinous, after he met Nausicaä on the island of the Phaeacians. To cheer Odysseus up, the bard Demodocus tells a tale of the illicit love affair between Ares/Mars (god of war) and Aphrodite/Venus (god of love), which has featured extensively in art. One day Hephaistos/Vulcan catches the couple making love in his marriage bed, and throws a very fine but unbreakable net over them. Hephaistos summons the other gods, who come and roar with laughter at the ensnared couple. 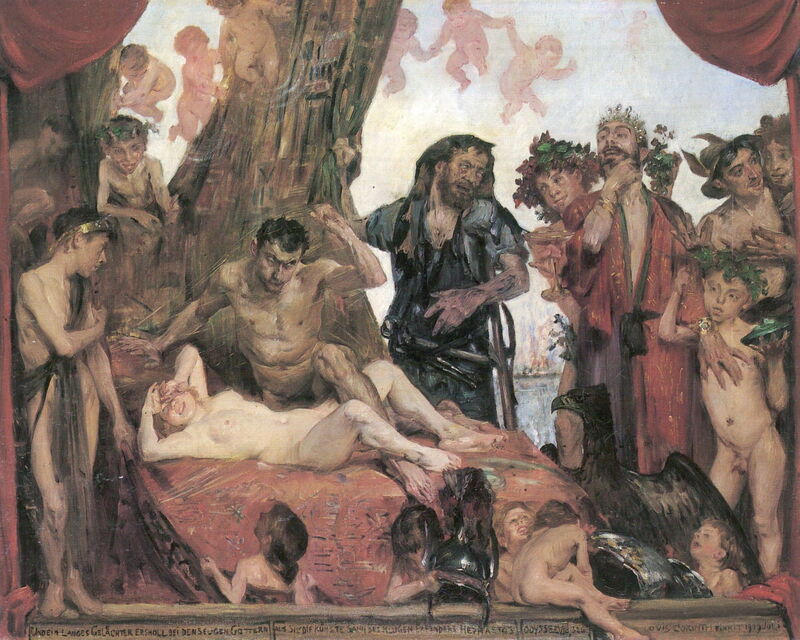 In this first version, Corinth shows Aphrodite recumbent on the bed, shielding her eyes from the crowd around her. Ares struggles with the net which secures the couple, looking frustrated. Hephaistos, clad in black with his tools slung around his waist, is talking to Poseidon (who wears a crown) with Dionysos/Bacchus behind him (clutching a champagne glass). At the right edge is Hermes/Mercury, with his winged helmet. Sundry putti are playing with Ares’ armour, and an arc of putti adorns the sky. Corinth also painted a second version, which he etched in 1920 for prints. Lovis Corinth (1858–1925), Morning Sun (1910), oil on canvas, 68.5 × 80.5 cm, Hessisches Landesmuseum Darmstadt, Darmstadt, Germany. Wikimedia Commons. Morning Sun (1910) is a wonderfully painterly oil sketch of Charlotte in bed, enjoying the sunshine. Lovis Corinth (1858–1925), Portrait of Charlotte Corinth in a Brown Blouse (1910), oil on canvas, 105 × 85 cm, Private collection. Wikimedia Commons. Contrasting with that is this more formal Portrait of Charlotte Corinth in a Brown Blouse (1910). 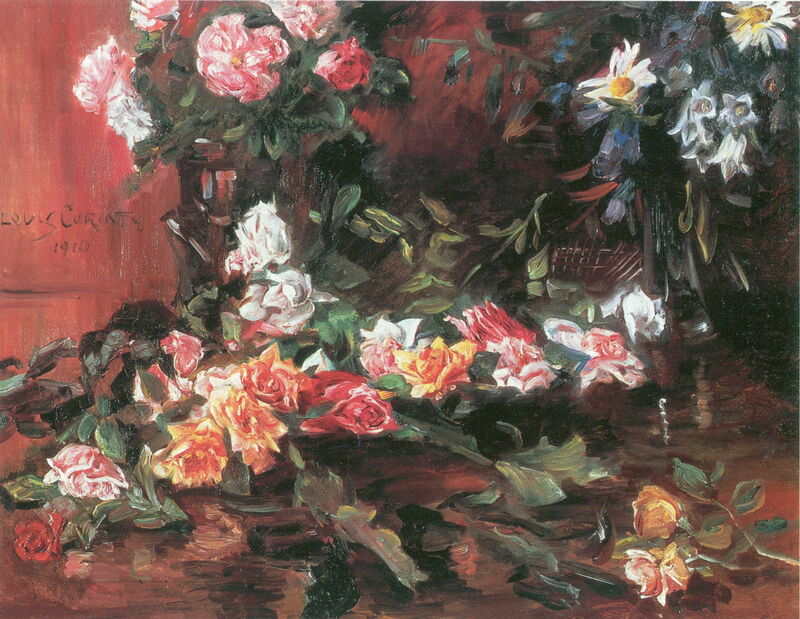 Lovis Corinth (1858–1925), Roses (1910), oil on canvas, 87 × 112 cm, Private collection. Wikimedia Commons. Earlier in his career, Corinth does not appear to have painted many floral or other still lifes, but after 1900 he seems to have been more attracted to them. Roses (1910) strikes a perfect balance between botanical detail and accuracy of the blooms, and looseness in the foliage and background. Lovis Corinth (1858–1925), Terrace in Klobenstein, The Tirol (1910), oil on canvas, 80 × 100 cm, Hamburger Kunsthalle, Hamburg, Germany. Wikimedia Commons. 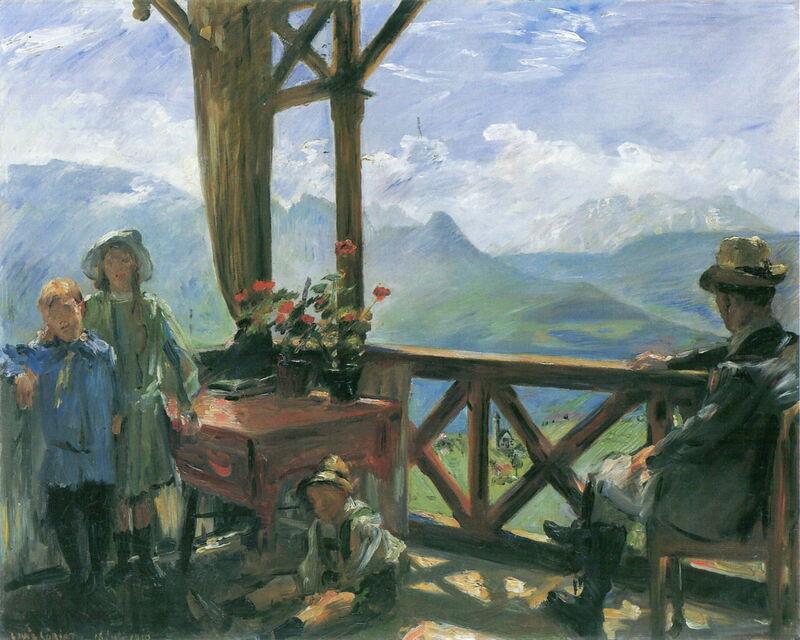 Over these years, Corinth and his family travelled, here to a Terrace in Klobenstein, The Tirol (1910). Klobenstein, or Collalbo, is a mountain resort at an altitude of just over 1000 metres in the South Tirol, in Italy. This painting shows the Hamburg businessman and art collector Henry B Simms (1861-1922) on holiday there during the summer. Simms was a keen collector of Corinth’s work, and later became an early purchaser of Picasso’s works too. The children shown are almost certainly his, and Corinth painted a more formal portrait of him in the same year. 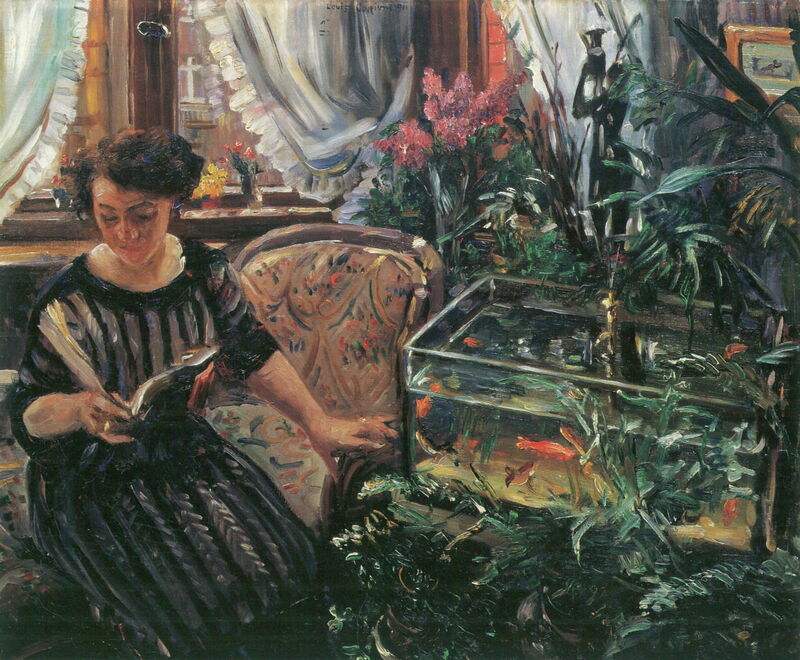 Lovis Corinth (1858–1925), Woman with a Fishtank (the Artist’s Wife) (1911), oil on canvas, 74 × 90.5 cm, Österreichische Galerie Belvedere, Vienna, Austria. Wikimedia Commons. Woman with a Fishtank (1911) shows Corinth’s wife Charlotte in their flat on Klopstockstraße in Berlin. The aquarium, full of goldfish, is surrounded by quite a jungle of indoor plants – Charlotte’s little corner of vegetation within the city flat. According to her later memoirs, Corinth took just four days to complete this painting. 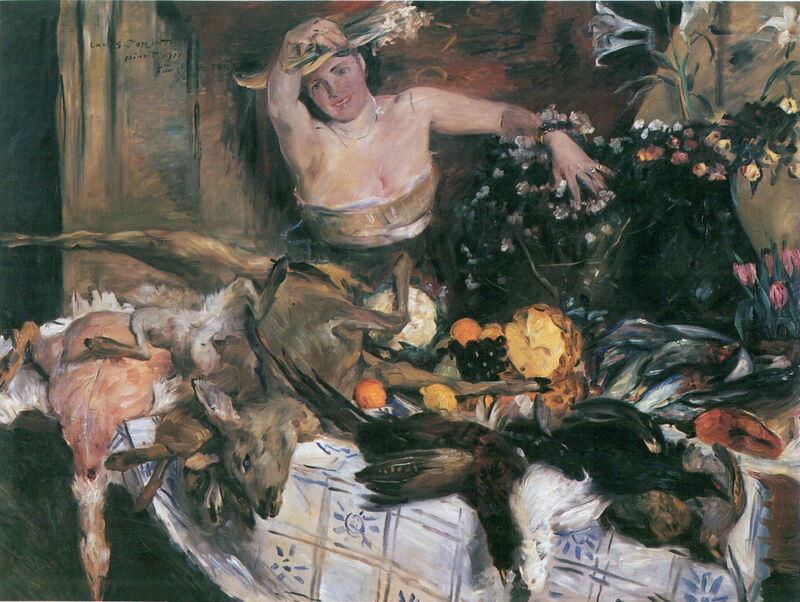 Lovis Corinth (1858–1925), Large Still Life with Figure (Birthday Picture) (1911), oil on canvas, 150.5 × 200 cm, Wallraf-Richartz-Museum & Fondation Corboud, Cologne, Germany. Wikimedia Commons. Corinth’s celebration of his fifty-third birthday on 21st July was inevitably more muted than that of his fiftieth, but he seems to have enjoyed painting a Large Still Life with Figure (1911), featuring Charlotte in a surprising outfit. They must have enjoyed quite a banquet afterwards, judging by the dead game on the table. 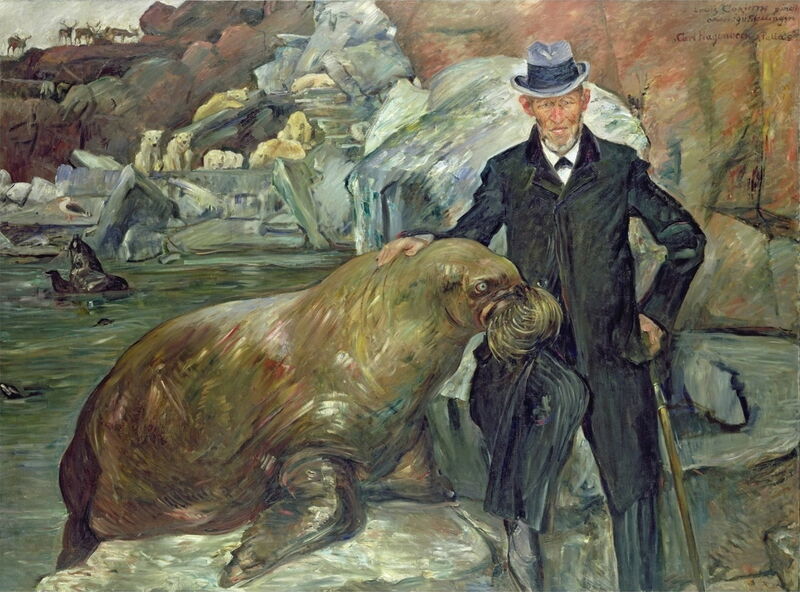 Carl Hagenbeck in his Zoo (1911) is perhaps his most unusual portrait, painted not of the splendid walrus, but of Carl Hagenbeck (1844-1913), a merchant of wild animals. Hagenbeck was the originator of the modern zoo with its ‘open’ and naturalistic enclosures, and established the most successful private zoo in Germany, at Stellingen, just outside Hamburg. He died just a couple of years following this portrait, after he was bitten by one of his snakes. 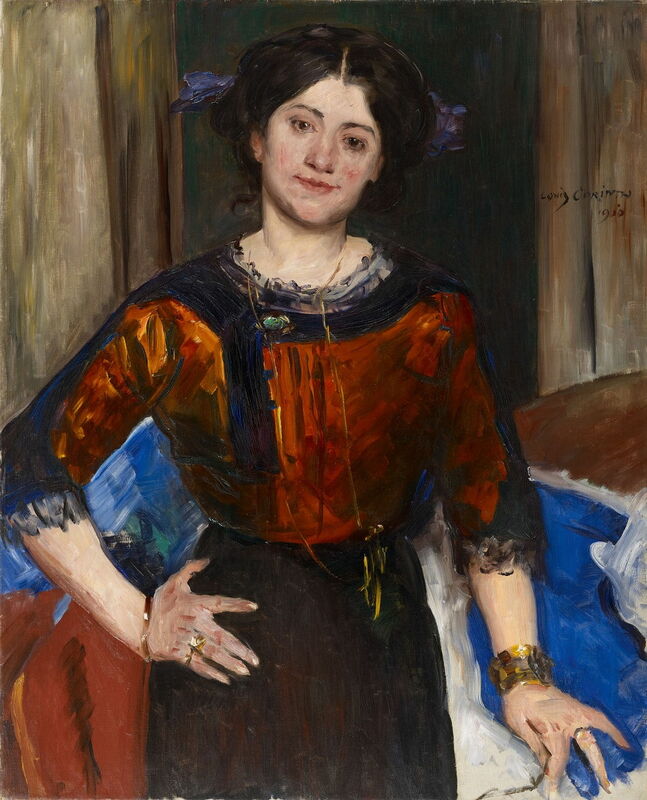 Lovis Corinth (1858–1925), Portrait of Frau Kaumann (1911), oil on canvas, 99 × 120 cm, Kunsthalle zu Kiel, Kiel, Germany. Wikimedia Commons. 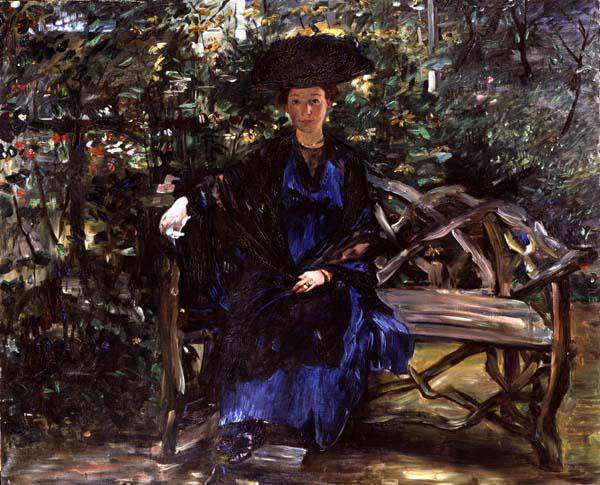 Corinth also seems to have done a good trade at this time in more conventional portraits, such as this Portrait of Frau Kaumann (1911) in richly dappled light. Then in December 1911, Corinth suffered a stroke: his left side – arm and leg – were paralysed. Corinth had painted his entire professional career with his left hand. He was only 53. Posted in General, Painting and tagged Corinth, Germany, narrative, Odyssey, painting, Post-impressionism, Secession, symbolism, zoo. Bookmark the permalink.